2010 is going to be quite an exciting year for my blogging! 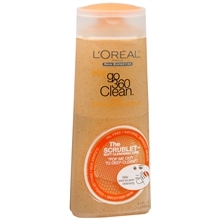 I plan on doing a lot more product reviews, like for L'Orèal's new Go 360 Clean. I got the Deep Exfoliating Scrub, so keep an eye out for that review. And of course I couldn't forget about the giveaways! There will be one each month for all of 2010! Each one will have a theme and will be full of all of the things I love and use! Thank you to everyone who has been reading and following thus far! I look forward to sharing much more with you in the coming months! Thank you so much! I was super bummed about not being allowed to participate because I didn't use a hanger. I used the wire form because I felt that it would hold up to the weight better than a hanger. If you're able to bend the hanger to get the round shape, then it's going to slowly bend into a not-so-round shape with the weight of the ornaments. Working with only the plastic ornaments has helped a lot, the wreaths aren't that heavy and none of the ornaments have fallen off. It might become an issues if they have to deal with a lot of temperature change, but hopefully all of my crazy gluing will have paid off. I have actually been over to your blog and I love it. I love that you are taking the Anthro necklaces and making them your own! You've done a wonderful job and I look forward to seeing all of the other ideas you come up with!